Virtual Reality Headset Just $15 Or $25 For 2! PLUS FREE Shipping! 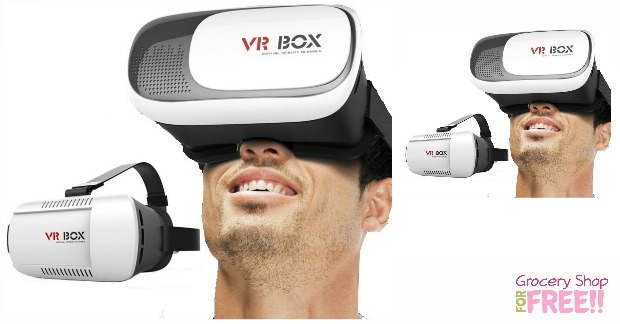 You are here: Home / Great Deals / Virtual Reality Headset Just $15 Or $25 For 2! PLUS FREE Shipping! Here’s a great deal and a perfect gift idea! I have seen these for more than $100! This is a one great deal! You can get this Virtual Reality Headset for just $15 for one or $25 for 2 with FREE shipping, too! Watch 3-D movies, play 3-D games and get immersed into the world of 360 degree videos with the the VR Box virtual reality headset. Featuring high quality 42mm spherical resin lenses, a slide out phone tray and Comfortable padded surrounds, this is a VR headset you won’t mind wearing! Fits 4.7 to 6 inch cell phones.